Some years ago, I agreed to contribute a volume to the Academic Press 'Organo- metallic Chemistry' series - the metals to be covered were rhodium and iridium. Initially, my plan was to discuss both the fundamental organometallic chemistry and applications in organic synthesis. When the first draft of the manuscript was complete, it was apparent that I had exceeded my allowance of pages by a huge amount. It was then that I decided that the catalysis section warranted separate treatment. 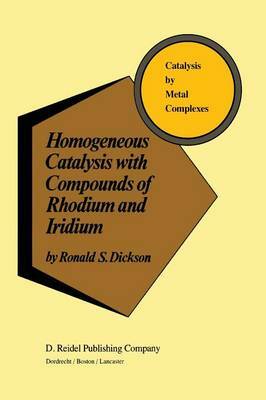 I am grateful to Reidel for agreeing to publish this volume on Homogeneous Catalysis with Compounds of Rhodium and Iridium as part of their 'Catalysis by Metal Complexes' series. The material I had for the original Academic Press project covered the litera- ture to the end of 1978. I decided to update this to the end of 1982 with a few key references from 1983. It is some measure of the rate of progress in this field that the number of references almost doubled during this revision.